Blocking the Sun: This is the standard reason given to idiots in the government. We need to secretly stop global warming, so keep it a secret that we're spraying. Global warming is the catch all con for everyone in the government. If you're smarter than this they'll give you a better reason. Health Erosion: As a side effect everyone's health and immune systems become more compromised. This is usually not an issue for most healthy people. Older people on average will now die sooner and any health complication is slightly more likely to be fatal. This is both a side effect of spraying and intentional. Anything to increase the kill rate without raising many alarm bells. Nano-fiber Propagation: To universally install a BioAPI in everyone they need to spray nano-fibers. These fibers cannot be put into the food supply or given in some other way, the uptake across the population would take forever and not propagate very efficiently. It's much easily just to spray everyone like an insect; and because it's happening to everyone and universal the herd mentality of the unwashed masses then justifies it. Nano-fibers specifically are a transport mechanism. Nothing more. They hold a payload for delivery. A payload that would otherwise be compromised by the sun or atmosphere or not make it to its destination (your body). Such as a virus, RNA, aluminum, nano-components, etc. The fibers are (surprisingly) quite harmless as everyone has them. Examples of these fibers can be found all over the internet or in the physical examples section of this site. The fibers must be independently sprayed, if they we're added to the jet fuel the extreme heat would destroy the payload. So it's not the fiber that is critical, it's the payload. Phase 2: This phase must be triggered and is extreme. It completely compromises your health and can do anything from kill you to simply monitor you. This phase cannot be forced onto you like phase 1 (technically it can but they don't do that yet). This involves multiple nano-sensors from ocular to heart and everything in between. I figure about 2% of the population has gone through this phase. If this phase is triggered in you they consider you evil as shown within the media examples page of this site. You must do something to trigger this phase, including eating cheap red meat, kissing specific people, using specific corporate health care/beauty products, etc. The objective they are reaching for here is to connect each event with a deadly sin of some sort. For example morgellons would be connected with vanity because your skin goes to hell. Ultimately this phase provides complete remote control of your body and mind, including the monitoring of your emotions, thoughts, body functions and everything in between. Chemtrail nanobot example Of course with something as extreme as nanotech being installed within people's body's you would assume there would be health implications and side effects. This is correct and covered on this site. The approach to handle these side effects has been one of "embrace and extend" it's called. There are several examples in the media section that show how the specific side effects listed below are recognized and then associated with something ridiculous or stupid which then discounts the authenticity in the mind of the viewer. In effect convincing the viewer to dismiss a real side effect as being something that's too crazy to be real. Each side effect is dealt with in a media example. Additional technical possibilities are also talked about in BioAPI section. Phase 1 & 2 - Cranium Clicking/Screeching: A phase 1 side effect goes back as early as 2001. Exactly what is happening is not completely known but involves some sort of nano-chip being installed/operated in the cranium (your head) of the host. This is probably the equivalent of a CPU of some sort. The actual clicking/screeching sound observed is usually at night on average once a month and only lasts for a few seconds. Completely painless and easily ignored or passed off by the person. Phase 1 & 2 - Aching Joints, Headaches, Fatigue, etc. : The saturation of nano-fibers has different effects on different people. The sheer numbers involved results is a random combination of health implications. Most people will not notice anything, or pass any slight symptom off as getting older. Other people who have more of a reaction will go to the doctor and get diagnosed with fibromyalgia. Fibromyalgia is a catch all disease that was created about a decade ago to give doctors something to tell the patient when they complained. The doctors can't accurate diagnose or understand what or why a patient is feeling a certain way, so the corrupt medical establishment gives them this nonsense to spew. These side effects are primarily phase 1 but are a constant problem across the board. Phase 2 - Continued Itching Skin: Often a specific part of the person's body (for example the left elbow) will become constantly itchy much more than the rest of the body permanently. This is intentional and is a sign to others that they have phase 2. This is reflected quite clearly in this media example. Phase 2 - Burning Smell: Phase 2 encapsulates the person's ability to smell to they can read/write scents to the person. I have no idea why they want to know what you're smelling. When inhaling or specifically exhaling quickly its often a burning/smoke smell that is noticed. It's unknown why, this must be an unwanted side effect. Or more accurately to encapsulate any neuron in the body involved in sensing (for example, smell, taste, etc.) there obviously must be some minor side effect. Interestingly when I cry the smell is amplified and it smells like buttered popcorn of all things. An example of how the media discounts this is demonstrated in the movie Bandits (2001). Phase 2 - The Left Eye: One of the high level concepts they push in the movies is the left eye is evil for some insane reason. In phase 2 an actual nano-camera will be installed in the left eye. People with this might comment on how they feel like there's a small bump in their eye under slightly drier conditions such as when going to sleep at night. This is documented in the physical example page. Note if you figure out you have a camera in the left eye they will probably install something in the right eye too. Phase 2 - Permanent Metallic Taste: Some people will comment on a metallic taste in the mouth. Typically when going to sleep it becomes prevalent. This is mostly a direct response to be monitored. The more they monitor you or your BioAPI the more of a metallic taste you'll receive. It is not a side effect of medication, that's the typical response a doctor will give you. If you are not on medication and otherwise completely healthy and all of a sudden have a permanent metallic taste in your mouth, you are being monitored 24/7. Phase 2 - Morgellons: Morgellon's can strike anyone. Its a problem with the nano-bots and fibers, whether intentional or accidental. The body's immune system can't see or recognize the fibers at all. So when the body can't accept the fibers anymore it beings to push them out through the skin. But the skin is a barrier because the fibers are too large. So the skin breaks up which is why people get lesions. Note that technically everyone has morgellons (nano-fibers), the actual mogellon's symptoms are when the person's body tries to get rid of them the only way possible. Some more conclusions can be seen here as well as a media reference. Chemtrails and dying plants: aluminum, drought, wildfire and coming famine? Plants, trees, grass in my village in mid Germany are going brown and dying. Here is an article I published a couple of weeks ago with some pictures that need updating as things now worsen. People say its too dry and yet I have noticed that those places where the rain collects or drops from a roof are often the places where the plants are worst effected. In other words the plants have died because they could not absorb water even when available. How ideal this method is to kill the crops all over the planet, that can no longer absorb the water and nutrients they need because of excess aluminum. This creates drought and also encourage wildfires, and hey presto wildfires have been occurring increasingly the last couple of years – think of Russia last year, and recently in Arizona in an area where people have already complained about of highly toxic levels of aluminum and barium in their blood. So I think the recent plant dying I have noticed is associated with the spraying of the air and the strange clouds gathering over my village. If I am right and if this is affecting many other areas of the globe, as I have heard, then apart from the effect of the toxic metals in Chemtrails on each plant, animal and human, there will soon be mass starvation and huge wildfires, in other words it is a deliberate depopulation agenda or to put it more plainly and in the words of X FBI chief Ted Gunderson: it is murder! Thanks Burgundia...something to look forward to...we all become "walking nanobots." 1. Subvert the Sun by Filtering the Vibration of the Electromagnetic Light thats coming in. Slow It down or retard it outright for the various Species so They do not Evolve/Mutate as intended by Prime Creator. 2. Obscure the Sunlight so as to Engineer eventual Crop Failure(s). "We do this now with Vigour and Intent as There are a great many things in the Heavens and there are those paying Us attention. This must not become common Knowledge. After all We have a Harvest to attend to..."
lawlessline wrote: Hi, Not really a earth changing thing more testing a theory. Been doing these weather share things like alot of people and the one I did on the 5th of October rang pretty much true for hurricane sandy. We have had a break in the clouds to reveal the chemtrails really at work and I have just finished the weather share for today. As yet I cann't give link because it is still uploading. But as a after thought which is not on the vid, is the chemtrails and the cloud direction. If I am of correct thinking there should be some seriously bad weather coming down on the UK, parts of Scandinavia, Hollande, Belguim, Northern France and west germany. If the thinking goes right this would also inturn create dry weather in the USA. This should all be in the coming 10 days, nit right now but in 10 days. The dry stuff will hit the US in 14-20 days. Residents and visitors of the Pacific Northwest hoping to have some dry weather for the days leading up to the Thanksgiving holiday will be out of luck. In fact, the Northwest will be the stormiest part of the nation through Thanksgiving. 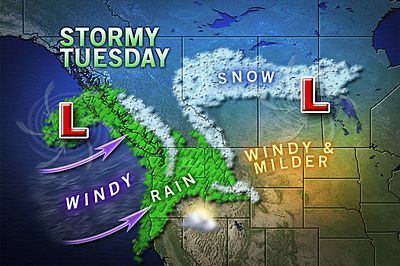 A Pacific storm train of weather disturbances will continue to barrel through the Northwest in quick succession bringing bouts of rain, snow and wind. At this time it appears that no prolonged period of dry weather is on the horizon. The series of storm systems will likely continue well past Thanksgiving and into the following weekend. These storms will bring rain, mountain snow and damaging coastal winds. If you look at the wind hitting Calif. This will push the snow back up and force down on the UK allowing that mild windy weather in the center drag the warm air up from the south. I have put another video on the chemtrails waiting for the upload to complete, but they have started again in ernest which will stabalise these patterns to keep them in place for some time to come.. This is the start of the dry season in the States. This should all be here in the coming 4 days. I really think I understand the workings of these Chemtrails and the geoengineering. Bang on the money I hope. Ohh wow that sounds bad, wishing snow on some and drought on another. But hey its not me doing the trailing. Sure my timing is slightly out but there seems to be a trait with this. Britain will grind to a halt within weeks as the most savage freeze for a century begins. Temperatures will fall as low as minus 20C in rural areas, forecasters warned last night, while heavy snow and "potentially dangerous" blizzards will close roads and cripple rail networks. OK here in the Pyrenees nothing doing, not a chemtrail in sight. So nothing to report. But to follow up the post from yesterday. http://www.sott.net/category/4-Earth-Changes The first 2 articles say it as I said and here we go. The round of Chemtrails should give us the weather for the coming 2 weeks there after. Hows the trails in your neck of the woods? Lots of chemtrails in Idaho this past few weeks. Seems to me that they are changing in nature... getting wider than what I saw a few years ago. Today we had the same thing here. i would consider it a very heavy day up to 75% at mid day and the afternoon clouds came rolling in. At the beginning of the day the trails were going East West, As the clouds were coming in from the NOrth they could be blocking the clouds from moving south, keeping the rain up north. Although there was the most beautiful red sky in the morning. So it was a case of reinforcing the clouds up north. Where in Idaho. North south west or east, no need to give too much details if you don't wish. Thanks for the info though Arrowind. -something is gobbling them up ? and, it seems to be working !!! if you are so inclined !!! When living in Oregon there were chemtrails alsmost daily especially a little further west in Walla Walla, Washington beginning back in 98 and still occurring now 15 years later. This has been going on for a long time. Fortunately where we are now and with trade winds - there is no chemtrail spraying. I truly wish it would stop - but then I would also like to know why? By now it appears that there are multiple reasons (military, biological warfare, weather manipulation, etc.). However, whatever the reason - I would like full disclosure of all of them just laid out in public so that we can see what we are dealing with. One thing for sure - the skies in the sixties were a lot different then the skies over much of the land these days. Film Presented by John Massaria. The audio is part of a teleconference call between Russ Tanner (Global Skywatch) and Dane Wigington (WIWATS/Activist) These calls happen every Monday at 7 : 30 central time and can be accessed through Russ' fb page. Please join us! Scientific Research explaining why they are spraying the sky's around the world. Learn and more importantly do something about the Chem trails being sprayed. Learn the details here in this short film. UN Environment Programme: 200 Species Extinct Every Day, Unlike Anything Since Dinosaurs Disappeared 65 Million Years Ago. According to the UN Environment Programme, the Earth is in the midst of a mass extinction of life. Scientists estimate that 150-200 species of plant, insect, bird and mammal become extinct every 24 hours. This is nearly 1,000 times the "natural" or "background" rate and, say many biologists, is greater than anything the world has experienced since the vanishing of the dinosaurs nearly 65m years ago. Wow they're quick on removing these films Magamud...will have to track it down in another format elsewhere...it is very good as I've watched before. Thanks Jen. Boy they are quick. I wonder how this Chemtrail thing will turn out? Will they tell us? I dont think so imho. Its more profitable if they don't, so they can identify those who dont take the Program. Big Biz processing the anomalies. Plus if they did admit it, people would be more suspicious, people like me would have more credibility. Oh my! Great site you linked Jen. Chemtrails to invade nano robots to turn us into Robots? Lions, tigers and bears Oh My!